I love your blog and the wealth of information you share. And, I always get excited when a new post is up as it’s my favorite design blog (and I follow a lot of them these days, since we’re building a new house). I also own your Rolodex and Paint collections, which are a great resources. May I also just say that I love that you show interiors with COLOR. 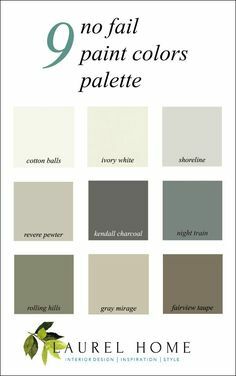 So much that I see is endless, boring neutrals. I’ve been reading your posts on mouldings (or is it moldings? ), and I’d love a post on whether they are appropriate or not. And, if so, how to work them in to a more modern-style home. Our under-construction house will lean Pacific Northwest Modern, with lots of glass, high ceilings, simple beaded baseboards/door trim, and simple jamb extensions for the window trim. This style was by far the best fit for the site. I’ll then nudge it a bit more towards new-traditional with more classic, simple-lined furnishings. Or at least that’s the plan. I’m struggling with how/whether I can add some mouldings to select walls. It certainly wouldn’t be everywhere, as we actually don’t have a ton of wall space that’s free from windows/doors, so can they be used in just one or two spaces? Or do they risk looking like orphans? I suspect the answer to both questions is yes, and it’s all in how it’s done, right? Is there a moulding style that meshes particularly well with modern? And, a bonus questions, can a more modern house mix with more new traditional furnishings? This is a real letter received recently. And, I think it’s a relevant topic to cover. And, that’s because I am frequently talking about getting the bones right. But what if a home is modern or contemporary (frequently used interchangeably) in style? First I will address the last question. Yes, absolutely! You can mix a modern-style home with traditional furnishings! In fact, there are so many examples of this on this blog, I wouldn’t know where to link. And it goes both ways. But getting back to mouldings. A home doesn’t have to have any mouldings in order to be elegant and classical. Kristin’s home, from her description, sounds wonderful with its high ceilings, large windows and simple window casings. It also sounds like it’s a rather open floor plan since she says that there aren’t a lot of walls. In addition, Kristin is not fond of all of the boring neutral interiors she frequently sees. However, a lot of neutral interiors can be phenomenally rich and interesting, IF done right. OR, they can be equally boring if not done right. You can read more that here and here to learn how to make a neutral room look beautiful and the reasons why some neutral palettes fall flat. Still, if she wants color in her modern-style home, that is absolutely fine. Another problem that I’m having in terms of addressing this topic is what basic style within the umbrella of modern and/or contemporary are we going for? Or maybe it has elements of all of these and others I’ve not mentioned. However, some of my most favorite homes have a combination of traditional and contemporary elements. In fact, this post is chock-full of classic contemporary interiors. And I know what may very well be your next question. Well, how do you put it all together, Laurel? This post should help because it’s about educating ourselves and then creating a plan. I think that the problem may very well be that people appear to think that there’s some sort of formula they can follow. And sometimes there is, but every situation is unique. So, it’s difficult to give direction when the terms are this broad. One size doesn’t fit all and for everything I’m going to say, there will be some other way of doing it. But we have to start somewhere. Let’s begin with the wall color for a more or less open layout for a modern-style home. I very much recommend that you stick with white walls for the main open living spaces. But, Laurel, white is so boring. I want COLOR. Ummm… yes, I know that. :] However, please allow me to finish before you voice your objections. Thank you. I promise you that you can have white walls, AND a white floor and have plenty of color! We need to begin with the envelope and I find that for a fresh modern-contemporary home that white walls look best. For rooms that are closed off, like a den, library or office, you can choose a color to paint the walls, or use grass cloth or another wallpaper. Same with a bathroom or powder room. And of course, you can paint the rooms upstairs if you have a second floor a color. But, for the main open living spaces, white is beautiful and will create a fresh background for art in a modern-style home. For the windows and doors, I would do a simple casing, or sometimes there is no window casing. A beautiful look that’s very popular these days are windows with dark metal muntins and mullions. Another way to add visual interest in a modern-style home is the ceiling. I am seeing a lot of ship-lap or tongue and groove paneled ceilings, either stained or painted white. If there are beams, they can either be stained or painted white. I prefer the latter. Please enjoy this home from a long-distance client. Now, it might be a moot point, because in a contemporary or modern home, you do not necessarily have to have a mantel. You can do the Candice Olsen hole-in-the-wall with a tile or stone surround. However, I prefer a simple mantel. Below is one that I found that I think is perfect for a modern-style home. via @amandajanoejones on instagram – photo – @stofferphotographyinteriors – white fireplace mantel – Fire Clay Tile – Both of these accounts have gorgeous examples of modern-style or contemporary interiors that are beautifully finished. While I’m on classic contemporary kitchens with some color, here’s one I found recently that I love. The next topic is wall mouldings or panel mouldings. Can you do them in a modern-style home? Sure. Why not? First of all, the mouldings are an embellishment. 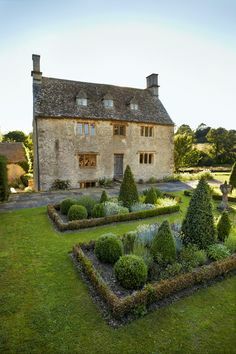 And while not essential, they can add a lot of architectural interest. In addition, it is quite popular these days to take an old home and make it more modern. I like this too if done tastefully. Here’s an example of an apartment that went way too far. And this is an example of home owners who renovated an old apartment and gave it a fresh modern look while still remaining its historical integrity. I chose the above photo because one could put a floral in a modern-style home, too. Okay, now I have a special treat. However, I realize that this is horrifying for some of you. Therefore, if you are one of those that is traumatized, you might want to cover up your eyes for a sec. Okay, good. I’ll let you know when you can open them. For the rest of you, here is what I want to show you. Susan is a kitchen and bath designer and owner of Susan Serra Associates. By the way, she says that they didn’t do anything special except for put a primer down and the floor has held up beautifully. Lucky me! Susan, recently shared some of her photos with me of her wonderful home on the north shore of Long Island and has kindly allowed me to post them. This home is a study in classic contemporary with a bent towards Scandinavian-modern design and for good reason. Susan is of Danish decent and still has family living in Denmark. In fact, by coincidence, she was visiting Copenhagen at the same time I was there last September, and I sat next to her at dinner one night. You might also recall that Susan was featured in this post about designers discussing their favorite most durable kitchen cabinet finishes. This is main living area and floor in Susan’s gorgeous Long Island modern-style home, after it was painted– obviously. A beautiful art wall in Susan’s living room. See? There’s a lot of beautiful color! I love all of Susan’s art pieces. 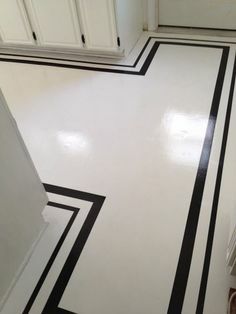 also love how fresh the painted white walls and floor look. Her home definitely has Danish-modern or Scandinavian styling, but what impresses me the most is how personal and warm it is. I think that people often think of modern-style homes as being cold, but not this one. Susan’s kitchen is quite extraordinary. It’s definitely an “unkitchen” of Scandinavian origins. Susan designed this amazing cabinet that houses a Gaggenau range. YES! I know! But that IS the range! Beautiful styling above and below in Susan Serra’s kitchen. This reminds me of a Dutch still-life. The eating area has a charming banquette and an amazing view of an inlet on Long Island sound. Susan’s daughter and granddaughter playing during the holiday season. And here we are again! I hope that you had a beautiful Thanksgiving holiday. I had a great time with my son in Western Mass, but I’m back in New York now. Please visit the curated holiday shop full of Hanukkah and Christmas decor, trees, wreaths and gift guides galore? Please also check out the hot sales pages for the latest and favorite finds. There are still a ton of sales as Cyber Monday is coming up. So, if you are interested, you can still get it at the current price and also get the new vintage guide as part of the new 2019 update. HELP ME PLEASE! My Child Picked An Ugly Paint Color! As always, amazing post. I’m certainly trying for a collected and mixed look. This post led me down a rabbit hole of old posts (which I’ve read but they were nice to revisit). I ended up on cherish because your side table post links to it, and scored these! What fun it is to see the beautiful homes of Designers. Susan’s home is wonderfully curated both in color and objects. Thanks for sharing.